Light a gas grill or preheat a cast-iron grill pan. In a bowl, mix 3 tablespoons of the olive oil with 3 tablespoons of the tarragon and rub it over the salmon. Let stand for 5 minutes, then season with salt and pepper and grill over medium-high heat, turning once, until crisp on the outside and just barely cooked through, 8 minutes. Transfer to a plate. Meanwhile, in a small bowl, combine the crème fraîche, mustard, horseradish and the remaining olive oil and tarragon. 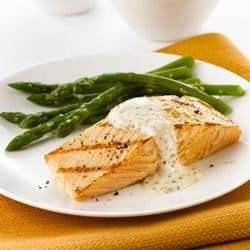 Season the sauce with salt and pepper, spoon over the salmon and serve.